The product roadmap is one of the most important assets possessed in a technology company. The phrase product roadmap generally conjures up visions of GANTT charts, detailed spreadsheets, pyramids and the like. Dates and deliverables are certainly derived from a product roadmap, and serve to direct the allocation and timing of engineering and development resources. But the product roadmap can serve a much more strategic purpose. A product roadmap can paint the technology vision for an organization. It can inspire technical talent inside a company, and communicate a company’s path forward, to outside stakeholders, in the company’s pursuit of technical excellence and dominance in its chosen market. In this context, a product roadmap is essentially a representation of the DNA of a company’s technology capabilities. Continuing development focuses on extending and expanding the current core product line, the offerings that represent the majority of a company’s overall revenue stream. Changes and improvements tend to be incremental, unless major market or demand shifts are occurring. New and advanced technologies and the products that are derived from those advances represent the efforts of a company to anticipate nascent, emerging and new markets. These efforts focus on seachange, order-of-magnitude improvements in performance, new features / benefits that are new to an existing market, or that target markets previously untapped by the company. It’s a real challenge to manage these three initiatives. If a company experiences a slowdown in revenue in its core business oftentimes it will curtail new technology development – a decision that is rational in a financial, quarter-over-quarter environment. Of course, this exposes the company to new, creative competitors, poised to pounce to take market share. Or, it can be rationalized that the continuing investment required to extend a legacy product doesn’t cost-justify – a decision that again is rational in a financial, quarter-over-quarter environment. This risks the company’s reputation, and may alienate longstanding customers. It’s a real challenge to manage and balance resourcing the DNA of your technology company. 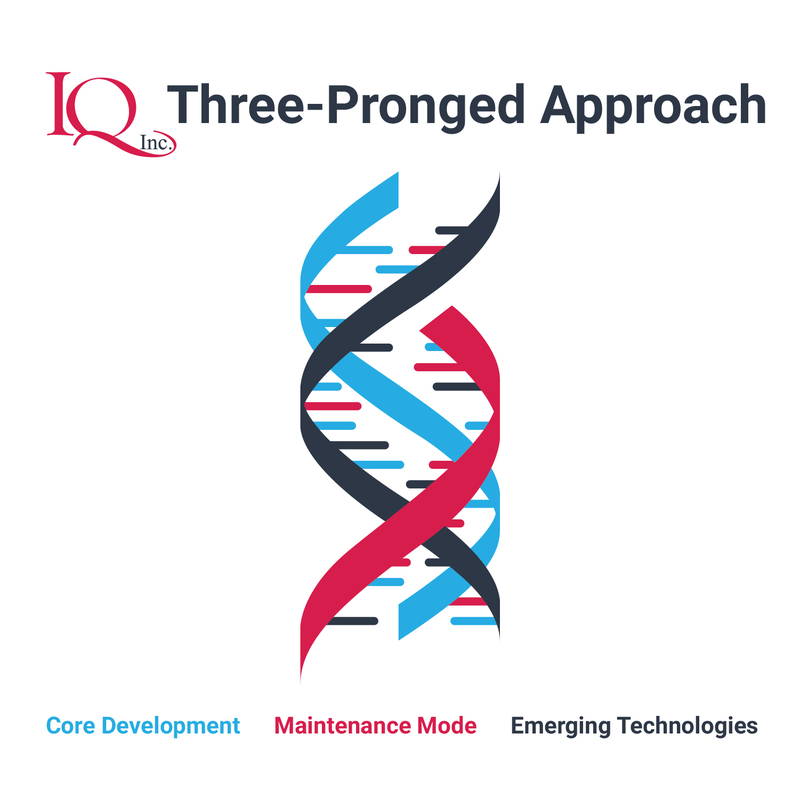 And the discussion thus far has not even touched on the quality assurance (QA) and testing required to support the development efforts associated with each of the three prongs. There are times when new technologies and products require technical expertise that doesn’t currently exist within an established internal team. This is an opportunity to advance a company’s new product initiatives in collaboration with an outside consulting firm without slowing down the effort, while sourcing, recruiting and retaining new talent, in a tightening technical labor market. IQ Inc. possesses decades of experience in assisting its customers in managing their product roadmaps. If you’re facing this challenge today, or see it in your near future, please contact IQ for a free consultation about your needs and how IQ can help you execute on your product roadmap.